Substitute Crewman on the 18 March 45 mission: F/O. 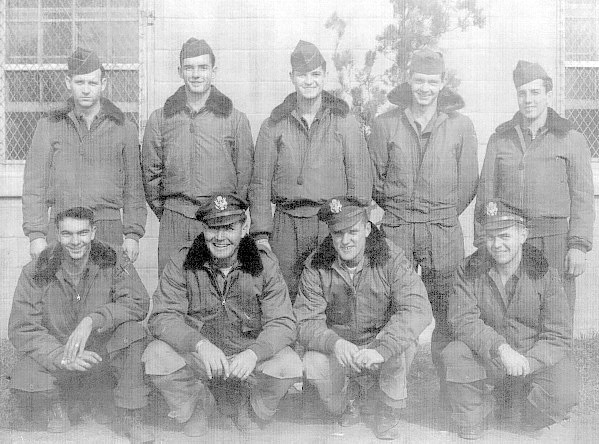 Richard P. Geyser (N), assigned to the 427th BS on 17 March 1945, for Fox (N). Crew incident: On 18 March 1945 mission #339 to Berlin, Germany in B-17G #44-6921 (No name) (427BS) GN-F. Experienced intense and accurate flak. The #2 and #4 engines were out. The left aileron and #4 gas tank were damaged. Gas and oil was lost. Lt Cassels made a wheels-up landing at a temporary airstrip along a bomb damaged main runway at Nasiesk, Poland - 25 miles NNW of Warsaw. The B-17 was left in Poland. B-17G #42-102411 Miss Lace (427BS) GN-P, piloted by Lt R. Krohn, also landed in Poland and joined up with the Cassels Crew. Both B-17s encountered Russian YAK fighters who gave the crews some anxious moments. The crews were interrogated by Russian Officers and quartered in Polish homes. Following some interesting experiences with the Russian and Polish civilians they were transported to American facilities and thence back to Molesworth via Russia, Iran, Egypt, Italy and France.